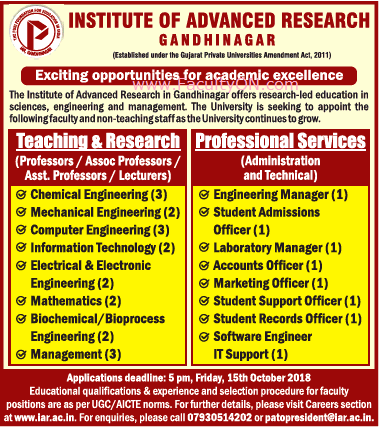 Institute of Advanced Research, Gandhinagar has advertised in THE TIMES OF INDIA newspaper for the recruitment of Teaching Faculty- Professor / Associate Professor / Assistant Professor / Lecturers Plus Non-Faculty jobs vacancies. Interested and eligible job aspirants are requested to apply on or before 15th October 2018. Check out further more details below. About College: Institute of Advanced Research also known as University and Institute of Advanced Research, is a private university located in Gandhinagar, Gujarat, India. The university was established in 2011 by the Puri Foundation for Education in India through The Gujarat Private Universities Act, 2011.